This B&H kit pairs the Manfrotto 504HD Video Fluid Head with the 536 4-Section Carbon Fiber Tripod to form a solid yet lightweight support system that's ready for action. The head supports up to 16.5 lbs (7.5 kg) of professional video gear, be it a mid-sized HD camcorder or a fully outfitted DSLR camera rig. The 504HD head introduces Manfrotto's redesigned counterbalance system with four presets from 0 to 16.5 lbs. The head's redesigned variable friction components are marked clearly with degree scales, and pan/tilt movement is vibration-free. 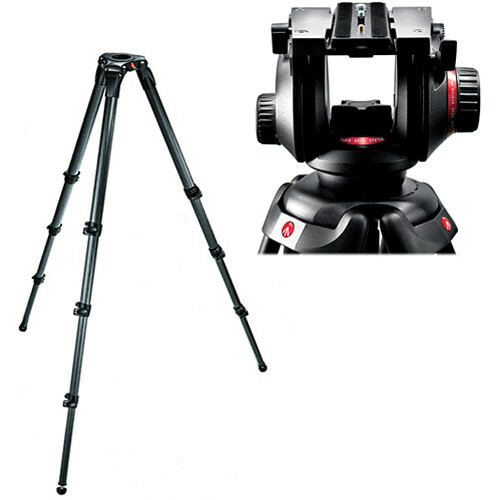 The 536 tripod's four sections extend to a towering maximum height of 79.2" (203 cm). An angle selector helps set the legs in the proper position, and rubber feet (with retractable spikes) help keep the system firmly in place. A screw-in half bowl adapter offers the user the ability to work with 75 or 100mm bowl heads. Box Dimensions (LxWxH) 16.3 x 10.9 x 7.5"
504HD Video Fluid Head w/ 536 4-Section Carbon Fiber Tripod Kit is rated 4.5 out of 5 by 303. Rated 5 out of 5 by joeybwhoelse from Good true fluid head, worth it The tripod is an investment. Camera formats trend in and out, but good fluid movement is not going out of style. Don't waste your money on a tripod that you're going to replace with this one. Spend the little extra and get this setup: it's light, it's smooth, easy to use, etc... If you want to be frugal then buy the Davis & Sanford or Bescor fluid like tripods, but you're only going to upgrade in the future. That's the mistake I made and I'm very happy with my investment now. Only issue: the plate isn't the same as older models, from what I understand this plate is a little larger in width (which makes it more stable, but not the same as older heads). Rated 5 out of 5 by ChiefPhotog from Silky Smooth I outfitted my Videographers and myself with these tripods after suffering bad tripods for years. My requirements were simple...be tuff, versatile, priced right and servicable...this tripod nails it on all accounts. The height range on this thing is great...really short to really tall...perfect! The carbon fiber legs are light...so is the head...it doesn't kill you to carry it around all day. The head is smooth and delivers counterballance for a wide range of cameras. We primarily use them for our Sony EX3's with shoulder/battery/receiver mounts. The case is good...keeps things clean and protected. The light built into the bubble level is great for low light situations. Rated 5 out of 5 by Robbie from Built Like A Tank I have been working with this tripod for almost 3 years now, and it's the only one I've ever owned. Having worked with the Blackmagic Cinema Camera, I needed a tripod that could support the weight of a fairly beefy rig. This thing holds up every time. The only difficulty I've had with this tripod is that it is heavy and quite a load to cary around even by itself. This tripod is best suited for film work as opposed to fast-paced documentary style shooting. If you're trying to move fast, this tripod may slow you down. I will still give this guy 5 stars for how reliable it is in support. Rated 5 out of 5 by COSMIC TANGERINE THUNDERBOLT from SUPERB TRIPOD THAT PERFORMS PERFECTLY Have been using my Manfrotto 504HD fluid-head w/ 546B tripod leg support system extensively for interior and exterior filming requirements. Extremely adjustable with smooth and precise tilt, pan, and drag functionality. Ball and socket control for fluid-head adjustment is excellent. The illuminated spirit level feature has been indispensable. An exceptionally well-designed and solidly built tripod system, with all-round fluidity, durability, balance, and stability being core to its being. Double-bridging technology delivers additional support and balance for heavier camera w/lens rigs. One of the best tripod systems I have ever used, and it is worth every penny. A wise investment for any independent filmmaker. Rated 4 out of 5 by Relwof from Great system, great price I've used this tripod system almost exclusively for about 8 months and I love it. Great mechanics, really wide range of adjustments for any application, and a really nice value for the build quality and durability of the product. The included bag is super easy to carry and store as well, which is great for when you're packing up the car to travel. Whether you're covering sports, shooting interviews, supporting a bulky cinematic camera system, or stabilizing a dolly track, the Manfrotto 504HD w/ 546B tripod system has got you covered. I highly recommend this product. Rated 4 out of 5 by Anonymous from Love the head and legs but kit has issue I only gave it 4 stars because the padded bag depicted in the pictures is not the one I received. I love the head and legs and the price was right for just those. The bag is an extra bonus but the pictures are misleading. The bag I received looks like a cheap bag with Manfrotto's name stitched into the side. It's also a lot longer than the tripod folded up. It also doesn't have the hard plastic end like the standard/typical Manfrotto bag in the picture has. Again, not a big deal but there's less protection than I was expecting for the head of my new system when being stored and moved. Rated 3 out of 5 by Reel Contact from Pluses and Minuses The head is smooth and the legs are a little cumbersome. You definitely need the bag to go with this as it is not something you can just sling over your shoulder. The counter balance knob cover on the left hand side of the head popped off the knob when I first extended the legs. Apparently if you squeeze the knob even inadvertently the cover will pop off. It would have been better if Manfrotto had put some additional string like connection to the knob cover because there is a good chance it will pop off again when I'm in the field and not notice it right away and thus lose it. (Gaffing tape has value here). So I will say that it is decent but could use some upgrades. Rated 4 out of 5 by Anonymous from highly versatile I use this tripod for multiple video applications: live event coverage, commercial production and corporate videos. I love its extreme range of height, from above a crowd's head to a few inches off the ground. I like the flexibility to accept 75mm or 100mm heads. The head that came with it is very smooth and has a good range of tilt/pan drag. My only concern is the locks on the legs. So far they've been rock solid, but I'm concerned that they could become loose over time. I prefer a collar lock that can be tightened until I'm satisfied with its positive connection. But given the price and versatility, it's a fantastic value. When it's time to replace my other tripods, I'll get more of these. The 504HD Fluid Video Head uses a 504 plate. Are there any Manfrotto still photography ball heads that are compatible with this plate, so I can switch my DSLR quickly between the 504HD video head and a photo head without having to change plates? Thanks! The only Manfrotto head that also can be used for photography is the Manfrotto MH055M8-Q5 Photo-Movie Tripod Head. This is a hybrid head that can be used for both Photo and Video. The quick release plates that will work on the this head and the 504HD should be compatible with each other as well. The 504HD head has a 75mm ball connection. Manfrotto does offer the 325N Video Head Adapter, this will turn a 75mm ball head in to a flat base one. However it is a product that requires some steps and installation, it will not be the right solution for quickly going between a tripod and a slider or jib. To quickly move the 504 head off of the tripod and on to a slider or jib you can look in to a 75mm Hi-Hat Riser. Also some jibs come with a 75mm connection already. Can I remove the head and attach a slider? Yes. Use this: Manfrotto 520BALLSH 75mm Short Half-Ball B&amp;H # MA520BSH. The 504HD hits the right side of the c300 mark II. Is this normal? I am unable to tighten it down. The 504HD's right side lock down lever is ratcheted. This means you can pull it out for re-positioning so you can tighten the quick release. Can I mount an articulating arm to this tripod? Which Articulating arm would fit? Does this head fit on Sachtler CF tripod legs? The 504HD head in this kit has a 75mm ball base. If the Sachtler tripod has a 75mm bowl it should work with the head in this kit. Does this tripod head would fit on the dana dolly? Yes it does. The 504HD Head has a 75mm Ball and the Dana Dolly (B&amp;H #DADDOK1) offers both a 75mm and 100mm connection. can this work with JVC GY-HM850u? The 504HD Head with 546B tripod has the load capacity to work with the JVC GY-HM850u camera. We recommend this tripod combination. However the kit on this page comes with a controller for Blackmagic Cameras, so I suggest you purchase the tripod and head through the link below instead.